I have far too many photos for one post, but it was so difficult to pick just a few, and I didn't really want to split one location up into multiple posts, so I just said f*** it and slapped them all into one anyways. Our three days in Seattle could not have been better - we still got to experience the infamous rain, but for a day and a half, we also got beautiful sunshine where we could slow the pace of our walks and talk about so many things: the impending move, furniture shopping, our new degrees. After three years of trips together under our belt, we've figured out a model that works well for us when it comes to figuring out the itinerary - lightly structured, yet flexible at (nearly) all times. This usually means we build a reasonably long list of sights and food and occasionally a show. With a little help from Google Maps, we figure out what places are near each other, and generally try to do things in an area, to prevent wasting money on too many ride shares. And then on that day, we go off of "feel" - what we feel like eating, doing, around that area. And if something that sounded great the week before doesn't sound spectacular anymore (or vice versa), we switch it up in a way that makes us happy. Granted, it doesn't always work out this way on our trips, but the little bit of research ahead of time usually saves us the headache and stress of planning the day of, when all you want to do is stretch your legs, explore, and probably eat something delicious stat. So in Seattle we somewhat followed this model, with the first day starting at Capitol Hill, the second day at Ballard north of the city, the third day devoted to Pike Place Market. I say somewhat because we definitely did make some last minute changes, like visiting the Museum of Pop Culture the morning of day two because of the heavier-than-anticipated(t rains (with the hope to wait it out before heading up to Ballard for lunch), but running to the Space Needle and Chiluly Garden the minute we realized it had become sunny and gorgeous and realizing this was our chance. Yes, it delayed lunch and led to our only hangry mini-argument of Seattle - but looking back I'm so happy we did it the way we did. And super thankful that I have a guy who will go with the flow, who makes these adventures infinitely more fun. I'll leave a full list of what/where we ate/saw in Seattle at the bottom of the post! Our very first stop - Mighty-O donuts! Clearly excited, despite the rainy conditions! The french toast donut is apparently one of their top sellers so that convinced us to have a little donut snack before dinner. I mentioned it above, but on our second day, we woke up to a lot of rain. So we changed our initial plans to go to the Chittendam Locks to see the salmon and opted for the Museum of Pop Culture since it was indoors. Which was fantastic! After spending about an hour and a half at the museum, by some stroke of luck, we looked up at the sky and saw sunshine! At that moment we knew we had to hit up the Space Needle nearby and delay lunch just a little bit further. It was totally worth it - clear skies so the city was in view at all angles, and fewer crowds than normal given the rain right beforehand. This is probably one of the moments I'm most thankful for on this whole trip. The city itself, I'm smitten. You might see me in Seattle someday, who knows. Some of the most stunning glass sculptures I've ever seen. Chiluly Glass and Garden was the icing on the cake after the views of the city atop the Space Needle. It's worth the extra money to check out this amazing place. My first oyster experience! I ended up liking these way more than I had anticipated, and the staff at the Walrus and the Carpenter are so friendly and very good at explaining the different types of oysters they had for the day. We discovered that we like oysters that are a little on the sweeter side, and not too large. Pro tip: go during happy hour, the oysters are half price and it's the perfect appetizer before dinner! By day three we were asking ourselves why we weren't eating salmon even though we were in a city known for the delectable fish (although everything in days 1 and 2 were spectacular). So Andrew announced early in the morning that this was our salmon day. We ate all things salmon - a salmon crumpet, a salmon pate piroshky, a salmon fishboard for dinner, alderwood smoked salmon before the famous New England clam chowder. I was so full of omega threes and happiness, I wish I could eat like that all the time. A scoop of sour cream rhubarb crisp in a giant homemade waffle cone for second dessert at Molly Moon's: a little tangy, a little sweet, and rhubarb yay! Half margherita, half bacon and onion wood-fired pizza and broccoli rabe in romesco at Delancey: we were so excited about the pizza, and we weren't disappointed. That crust, oh man. CRISPY, YO. A fat slice of strawberry rhubarb crumble pie from Pie Bar: another time where weird Tuesday hours foiled us! We initially planned to eat pie in the bar itself only to find out that on Tuesdays, they only have the walk-up window service. No matter, we took our pie, found a bench, and nommed HARD. The crumb was incredibly buttery and the fruit not too sweet. Brownie points to the establishment as well for letting us use their bathroom despite being closed. The wild smoked salmon blended with cream cheese on a crumpet at The Crumpet Shop: crumpets are so cute and tasty and I wonder why they aren't a bigger thing here in the States! 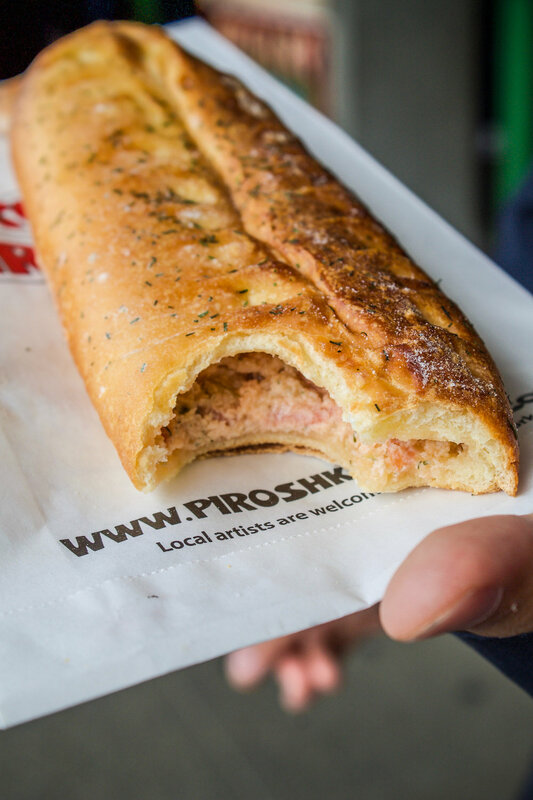 A salmon pate piroshky from Piroshky, Piroshky: a piroshky is a big bread-like pastry and it had salmon in it so it was obviously delicious and they put a delightful amount of dill in the pate. Also the whole place smelled like melty butter and pastry and you really can't complain with that. The mac and cheese from Beecher's Handmade Cheese: you know, as a break from all the fish. Gotta get my carbs and cheese somewhere! Warning: not for the faint of heart, this is hella rich. THE famous New England calm chowder from Pike Place Chowder: the chowder was 100, but the sourdough was 110%. Would say it's worth the wait if you haven't been there before, but maybe not somewhere I'd make a go-to spot for myself personally if I ever went back, but others might disagree. A ginger beer soda float, and later in the evening, an extra-gingery ginger beer and a white peach ginger beer from Rachel's Ginger Beer: this totally made Andrew excited, he is so into ginger beer lately and the fact they have a whole store dedicated to it - YES. 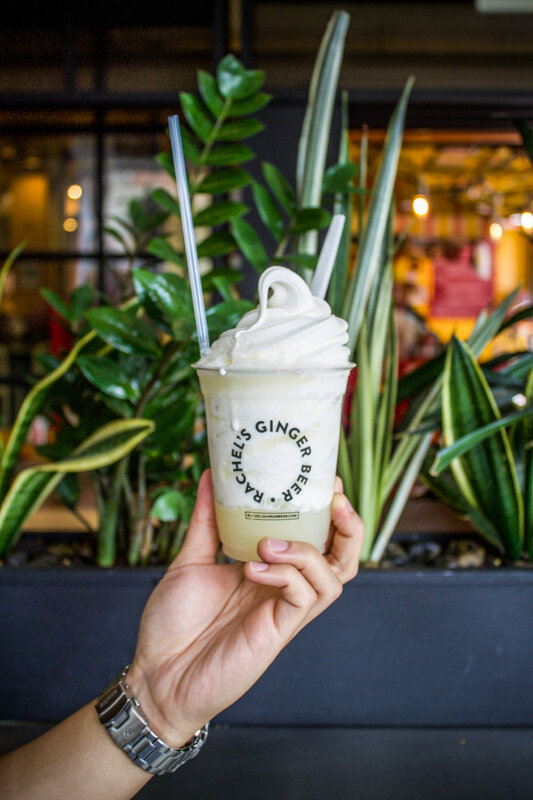 More ginger beer shops, please! The fish board and the baby lettuces at No Anchor: a swanky beer-oriented bar that served amazing food and had amazing service. What we deemed as our "fancy" date in the city. Loved the atmosphere here, and like I said, amazing service which totally made the meal. If you find yourself in Seattle, embrace every second of its magic - from its bipolar weather to its breathtaking florals, its humongous fish selection to its fantastically hilly, metropolitan feel. I loved it here, and hope to some day return.